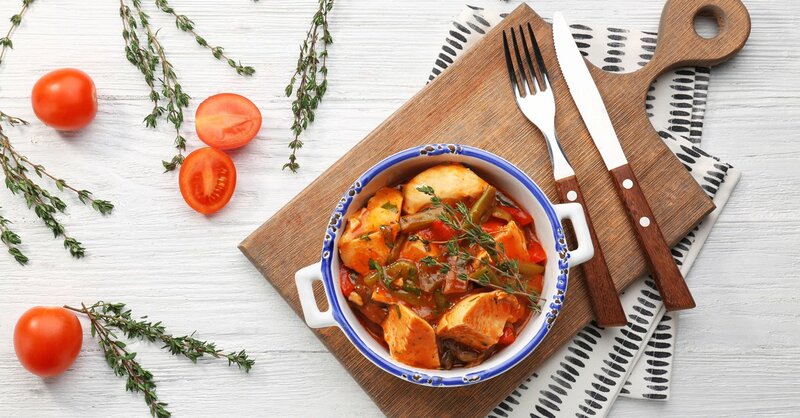 Hugely popular chicken cacciatore is traditionally an Italian, rustic hunter's’ dish so it is a delicious way to incorporate healthy, low FODMAP seasonal vegetables and herbs in a nourishing, mouth-watering lunch or dinner. Regardless of the season your whole family will enjoy this dish! Heat the oils in a large saucepan or sauce pan over high heat then add and cook (while stirring) all the vegetables (except the oyster mushrooms and olives), spring onion tops, rosemary, oregano, sugar and pepper for about 8 minutes or until lightly browned and fragrant. Stir through the chicken pieces, oyster mushrooms, tomato and stock. Cover and cook on medium heat for 20-30 minutes or until chicken is cooked through and sauce thickens slightly. *Alternatively, cook in slow cooker on high for 4 hours or low for 8 hours. Just before serving add olives, fresh basil or parsley and season with salt as desired. Serve with mashed potatoes, cooked rice or a low FODMAP pasta. This recipe uses fresh and seasonal vegetables! So, regardless of the season, check your veggie shop, garden and use your Monash app or booklet to select any low FODMAP vegetables you fancy. Freeze the leftovers for a quick and healthy meal.